This week I have been trying out some products from the White Rabbit Skincare range. 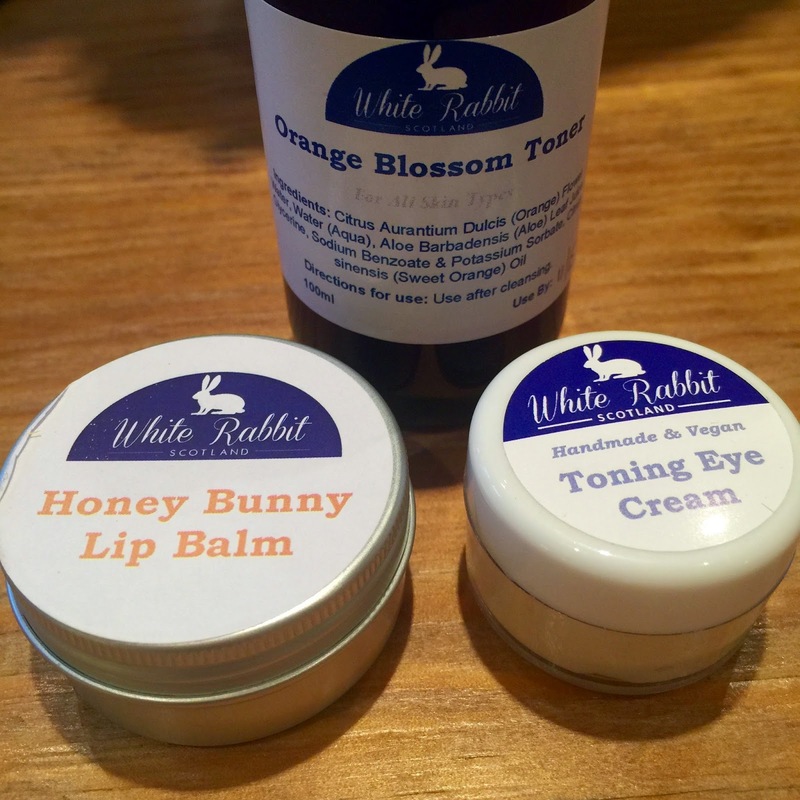 I first became aware about White Rabbit Skincare through my subscription to The Vegan Kind. All of their products are vegan, cruelty free, handmade and use completely natural ingredients. So they tick a lot of boxes! I normally only buy my products from shops or large retailers but the White Rabbit Skincare range has really opened my mind up to shopping from smaller independent sellers online. I use Etsy a lot but it hadn't even come to my attention that you can buy handmade beauty products on their site. The three products that I have been trying out have been the Honey Bunny Lip Balm (£4), the Toning Eye Cream (£8) and the Orange Blossom Toner (£6.50). The windy cold weather recently has made my lips so dry and they always seem to be peeling which is really annoying! The White Rabbit Honey Bunny Lip Balm has been really effective at moisturising my lips and softening them up. They feel so smooth since I've been using this and I love putting it on at night just before I go to bed so it has a chance to really soak into my lips. I have never really used any eye specific creams before but the White Rabbit Toning Eye Cream has become a regular feature in my evening skincare routine. Firstly it smells amazing! I also find it really relaxing to dab some of this on around my eyes once I am in bed and as I lay there I can really feel my skin absorbing all the goodness. Afterwards my eye area feels so firm and brighter. It also definitely helps in reducing dark circles under the eyes and any puffiness. Finally, I have been trying out their Orange Blossom Toner. Again, I have never really got into a habit of using a toner regularly after cleansing, but after having used this I feel like I would miss not having it in my routine. As you can probably guess it smells like oranges and so fresh! I find it so refreshing using this on my skin after cleansing and it leaves my skin feeling extremely soothed and soft. Overall I am really excited about these skincare products and I am looking forward to sampling more from the White Rabbit range in the future. These products would make perfect little gifts, especially with Mothers Day soon upon us! Their Take Me, Try Me kits are ideal for introducing this range to your nearest and dearest, or why not give them a try yourself!